Supplying professional graphic designers and companies everywhere Signs Banners Online ( factory printing and sewing ) service crews are experts at crafting large banners and signs. 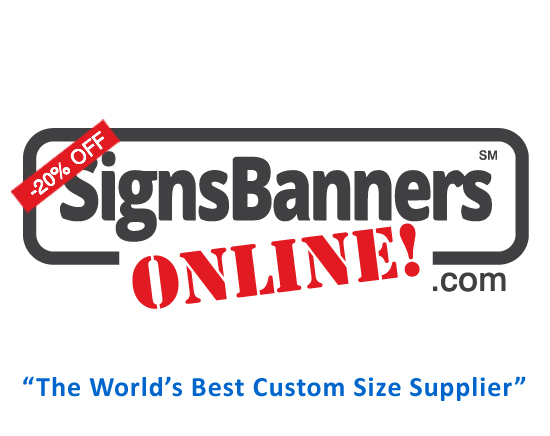 You can send them your custom size banner printing advertising orders and they can do it all. They are specialist large size banner makers. For customers who can't self design for big banner production they also have a design department and live chat. Professional graphic designers using Photoshop (CS/Elements/Express) can set up the file for automatic instant printing. They can upload to print using Signs Banners Online 'Web2Print' technology and manage all stages from the factory to their door. Custom banners become easier to buy online with them. I like seeing how big they make their banners. The vendor fabric graphics are unreal. Amazing definition its top quality fabric coating they use as base stock so the printing looks good.